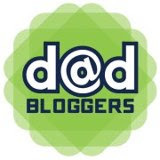 Daddy's in Charge Foolproof Recipe (for the Wife) | Daddy's in Charge? Let's face it dinner time can be a very stressful time, there are just too many people to please. 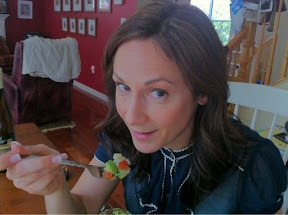 I know in my house dinner is usually a smorgasbord and I know that is wrong. The kids should eat what I make blah, blah, blah. I get all that. Sometimes though things have to be done to make the wife happy. When the wife is happy, daddy is usually happy if you catch what I am saying. This recipe is actually a pretty simple one that requires no actual cooking, some might not like this style of "cooking", but I have found that the misses is much nicer to me when I make this dish. The first ingredient is obviously shrimp. 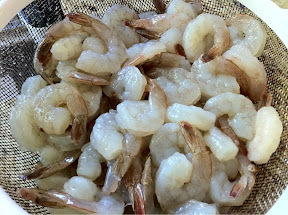 I usually use two pounds of raw shrimp. Make sure that you remove all of the stuff that you would normally not eat, like tails and rise other things that hang off of them. 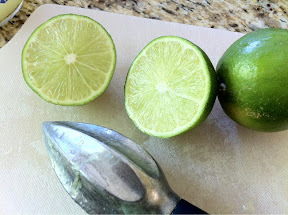 Next you need to squeeze enough limes to make around 3/4 cup of juice. Makes sure that you have no open wounds or this will be a tortuous process. I have found out the hard way, it's pretty painful. 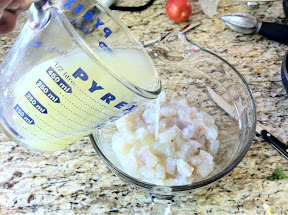 Pour that juice over the shrimp in a medium to large bowl and let that sit aside for about five minutes until it gets a little opaque. 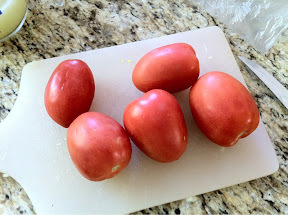 In the meantime you are going to chop five Roma tomatoes and one medium to large onion. 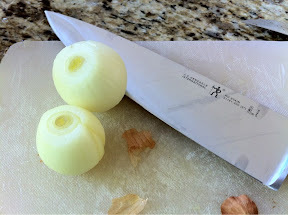 I know in the picture I have two that's only because I thought I had a bigger onion on hand, which I clearly did not. A reminder, make sure you have all of the ingredients to make this dish before you make it. Also while you are doing this you will finely chop one big bunch of cilantro. It usually yields about had a 1/2 cup which is perfect. Once that is done mix it all together and put in the refrigerator for about an hour. 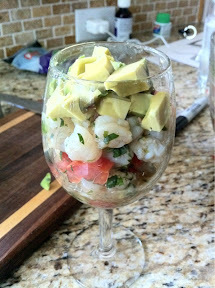 The lime juice will actually "cook" the shrimp. I know that sounds kind of strange but it works. 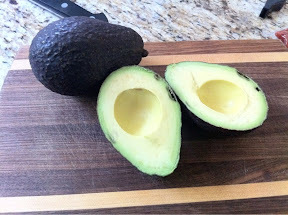 While you are waiting you can chop up an avocado which will be added right before you serve this dish. Do not mix it in as the person eating this dish will take care if that. The final two ingredients are simply for taste so you can put in as much or as kittle as you would like. 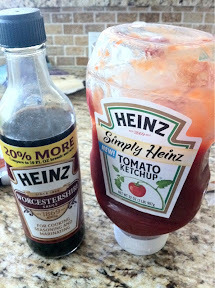 I usually put in a few splashes of Worcestershire Sauce, and around a tablespoon of ketchup. For sake of pictures I served this dish up in a wine glass, I know that doesn't make much sense, but I was looking for Martini glasses which would have been much cooler. Everything is cooler in a martini glass, think James Bond. Now that the dish is done hand it over to your wife and watch her go crazy. You my friend should be in for an enjoyable evening.